Using the Eco-grow coco tablet’s extremely fertile potting mixture, growing flowers, plants, herbs and vegetables at home cannot possibly go wrong. The tablet is easy, quick and clean to use. For children, the coco tablet is not just educational, but also a lot of fun, as the tablet miraculously expands in water! 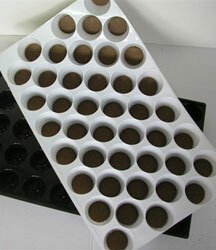 For Buzzy, Eco-grow produces made to measure coco tablets for all sorts of DIY packages for the home grower. 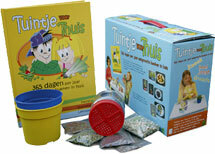 By adding the Eco-grow coco tablet to this DIY package for children, GardenFriends turns gardening into child’s play. Ecological companies that want to make a name for themselves cannot find a better way to do so than by providing their own environmentally friendly promotional article. The coco tablet is an ideal, 100 percent organic promotional article. 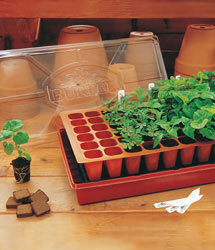 The lightweight potting mixture is easy to carry, simple in use and is guaranteed to make seeds grow and flower. Fertile cocopeat has been used as the ideal potting mixture in the professional growing market for years. The cocopeat in tablet shape not only provides the professional grower with the advantages of optimal aeration and watering conditions for excellent root development, but also the user-friendliness of the round tablet shape. 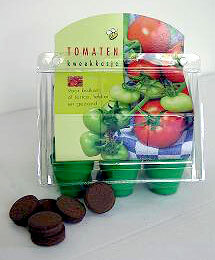 The special Burpee trays filled with Eco-grow coco tablets, which make growing cuttings much easier. Further references by companies using our coco tablets in their products.